Mexican Street Corn Casserole - ll the flavors of Mexican street corn but requires no flossing after eating! 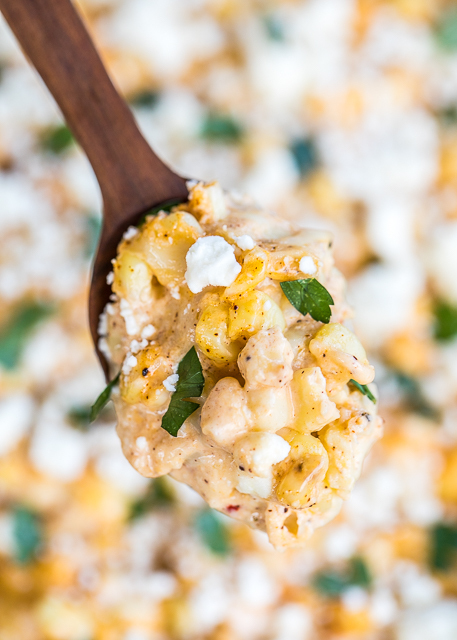 Corn, mayonnaise, sour cream, lime, parmesan, pepper jack, chili powder and feta. Can make ahead of time and refrigerate until ready to make. Great for potlucks, cookouts and the holidays! You might want to double the recipe - this doesn't last long! 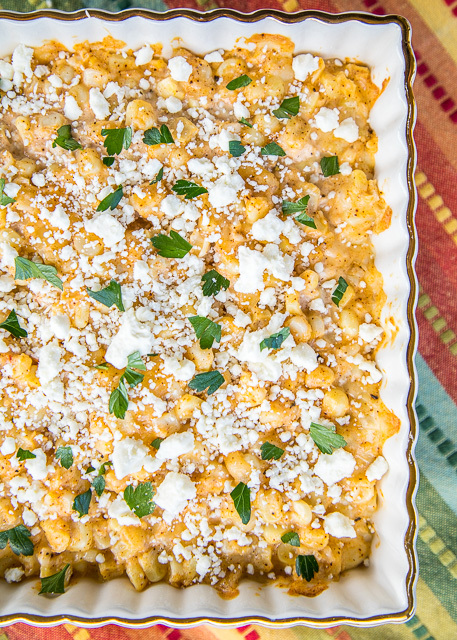 I am in love with this Mexican Street Corn Casserole. It has all the flavors of Mexican street corn but requires no flossing after eating! That's a win in my book!! Have you ever had Mexican Street Corn? It is corn on the cob slathered with mayonnaise and covered in cheese. Sounds amazing, right? I had some summer corn in the freezer, so I decided to whip up a quick Mexican Street Corn Casserole when we grilled out last week. OMG! SO good! It is hard to beat baked corn and cheese. 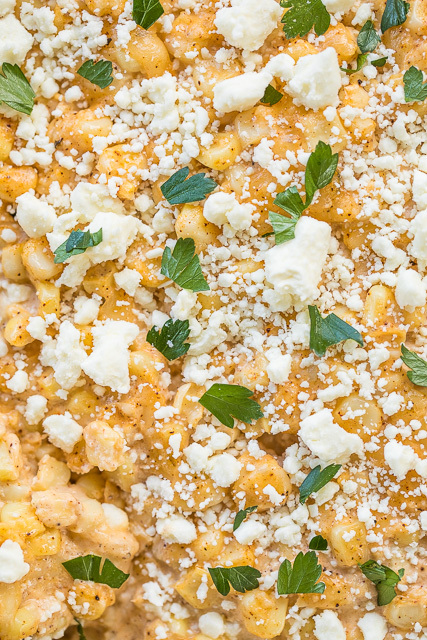 This Mexican Street Corn casserole only takes a few minutes to make. You can even mix this up ahead of time and refrigerate overnight. 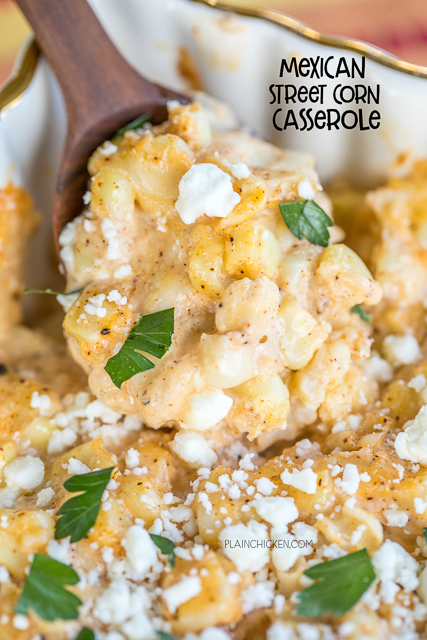 Perfect for a quick weeknight side dish or even the upcoming holidays! If you are serving this to a crowd, you might want to double the recipe. It doesn't last long! In a large bowl, combine corn, mayonnaise, sour cream, lime juice, chili powder, parmesan cheese and pepper jack cheese. Pour corn mixture into prepared pan. Bake uncovered for 30 to 40 minutes. Remove from oven and sprinkle with feta cheese. Can you use frozen or canned corn and if so how much??? You can use either - use the amount listed in the ingredients. Wow, yesterday I made this with a bit of poblano peppers, fantastic! Then today I used the leftovers for the insides of enchiladas, then covered with a chili con carne I make....YUM!!! Oh my! Bobby, great idea. I just bought a bucket of Poblanos at the Farmer's Market yesterday. Believe I will take this recipe and stuff the Poblanos and top with Breakfast Chili. Can't wait to see how good they are. The peppers I just got are huge so I may have to increase the recipe a little.